Learn all 7 levels of spells for Conjurer, Magician, Sorcerer and Wizard with one character. Level a character to level 10. Level a character to level 25. Level a character to level 50. Be promoted at the review board for the first time. Complete Tales of the Unknown. Destroy every statue in Skara Brae. Purchase services at an inn, a temple, Garth's and Roscoe's. Cast the Dreamspell for the first time. Enter the home of Saradon. Complete The Bard’s Tale II: The Destiny Knight by defeating Lagoth Zanta. Acquire over half of the Destiny Wand pieces. Make your first deposit at the bank. Win a hand of blackjack at the casino. Gain your first piece of the Destiny Wand. Gain 30 unique pieces of insight from the Sage. Purchase services at Garth’s, Roscoe’s, an inn, and a temple, advance a character at the Review Board, make a deposit at the bank, and play a round at the casino. Master all magic levels of the Archmage class. Visit the ruins of Skara Brae. Uncover the final prophecy of Longinus the Mad. Complete your quest in Arboria. Complete your quest in Gelidia. Complete your quest in Lucencia. Complete your quest in Kinestria. Complete your quest in Tenebrosia. Complete your quest in Tarmitia. Strike the killing blow against Tarjan with a rogue. 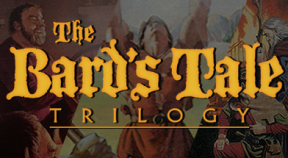 Complete 'The Bard's Tale III: Thief of Fate' by defeating the Mad God and ascending to godhood in the heavens above. Cast NUKE for the first time.